Discussion in 'GPS Tracks - Central, Texas & Gulf States' started by Cannonshot, Sep 23, 2008. This ride covers a great deal of history involving the Pony Express and the Emigrant Trails. The track itself is about a 1,500 mile ride. 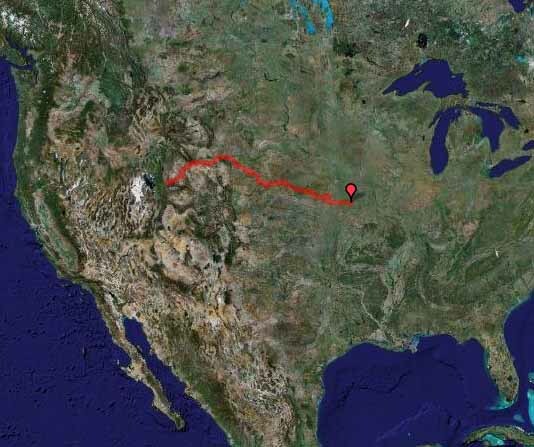 It starts in St Joseph, MO, and ends in Evanston, WY. It took me six days to ride the tracks as there are a couple of hundred points on interest as part of the track. You can ride this all at once or select portions for day or multi-day rides. It is suitable for large adventure bikes. 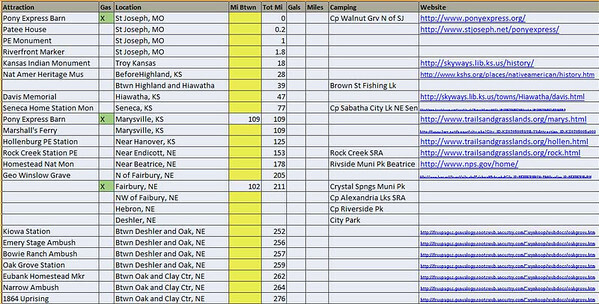 In support of the ride, I have prepared a spreadsheet that gives planning mileages, gas stops, potential camping spots, and give clickable web links for the points of interest. Here is a sample page (outdated info in this picture - have a more current version now). If you decided to take this ride and want a copy of this five page spreadsheet for your planning, PM me with an e-mail address and I will send it to you. If you prefer a .gdb instead of a .gpx, PM me with an e-mail address and I will send you a .gdb file. If I can be of other assistance, feel free to contact me. Added a route to the basic file of waypoints and tracks. Some GPS units may automatically recalc when you load so beware of small changes. This is what I have for out west. Rode some of it. how much was dirt road, how much asphalt? also how much private property obstacles? I cannot download the .gpx files of yours to my iPhone. it has .gpxwebloc, instead of .gpx. PM me an e-mail address and I'll send them out. Replaced lost file. Downloaded 1013 times from previous personal site (17,273 views there).